Remember the days when we read the newspaper over a cup of coffee every morning and watched the evening news on TV? We were quite happy to get our news just once a day. Now we expect to see eye-witness accounts of events as they are occurring. This appetite for instant visual news has changed the way news is gathered, reported and consumed. 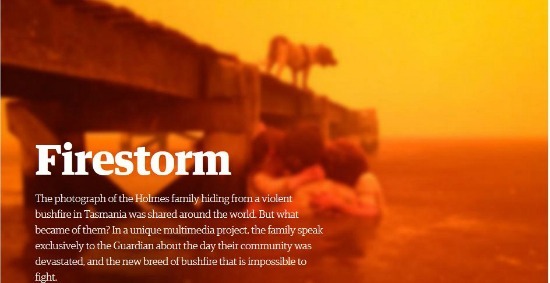 This interactive report about the firestorm in Tasmania is a perfect example of what can be done. Watch it – it’s quite an experience. 85% of adults use the Internet. A project like this requires a team of talented people with new digital skills, but many newsroom no longer have these resources. While this is not good news for the media, it has opened many new opportunities for businesses and organizations: A savvy Digital PR team can become a content resource for the media (earned media), publish their own news, (owned media/brand journalism) and buy space for branded content on news and social sites (paid media). In a recent Q & A with top journalists and bloggers from major publications they all said that their editors demand visuals with every story. Why? Analytics of viewer behavior shows that when a story has images, video or charts to support and enhance the text, it can increase views by as much as 9.7x.The L.A. Times calls it “No story left behind.” All of them agreed that they use outside video. The only caveat was that the images and videos have to be original, good quality and relevant to the story. Think like a publisher. Get your Digital PR team trained to produce excellent visual material that extends the story. Use smart PR tools to house and distribute your content. Then work with the media and help them to tell stories that capture people’s hearts.